I have not been feeling the best for the past few days, so I have been trying to simultaneously lay low and wrap everything up for end-of-year with work. Not an easy balancing act. My therapist also had to cancel our session today because she was sick, for which I was bummed. I find that I need that release/discussion time. So instead, midday I took a break to finish wrapping a few presents to put under the tree: books for the boys from Mommy and Daddy, and my gift to Ger. Only waiting on one lone gift that I ordered online that has not yet arrived – to the point where I am concerned and emailed the company, but have not yet heard back…. I ordered a lamp for our living room and it FINALLY arrived. Theo and I now have a morning ritual of reading together while we wait for the bus, and there was not enough direct reading light by our couch. 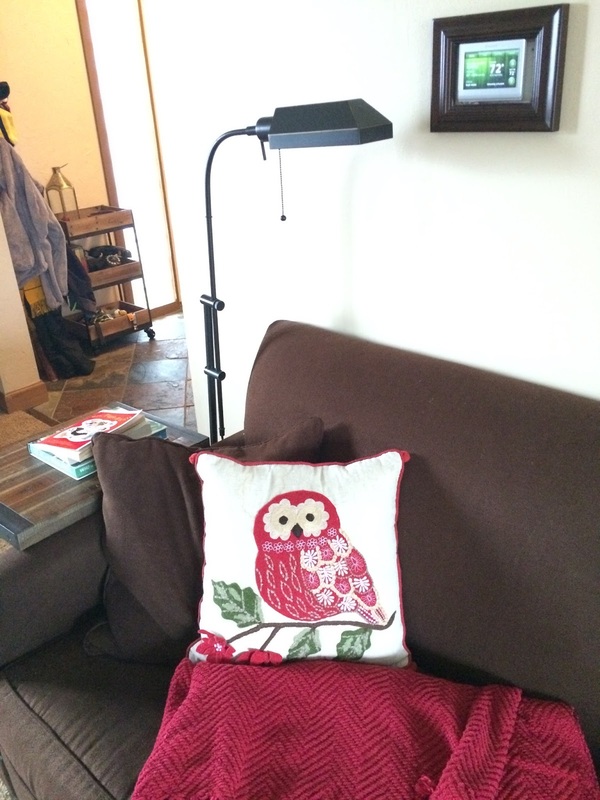 Not wanting to spend a lot of money, I found a lamp at World Market, while they were running some type of sale. Then on top of that, due to a shipping glitch, I got an extra percentage off. Not happy that it took nearly 3 weeks to arrive, but very happy with the resulting cozy reading spot. Theo and I are currently reading Mrs. Piggle-Wiggle. I have multiple playdates lined up for Theo next week when he has no school. I gave him the run-down of what we will be doing. He kept saying “Then what about the next day?” until I got to December 29th, at which point I said “And then I’m not sure what we are doing next.” At least I have him occupied for next week. Will cross the bridge of the week after when I get to it. On top of not feeling the best, Ger had an evening work event last week and TWO this week for various holiday/end-of-year celebrations. Kids and I ate out last night and tonight. Last night it was a place called Pockets that is less than a mile from us, but we had never been there. They happened to be donating a portion of proceeds that night to Theo’s school so it seemed like a good night to try it, and it was tasty! As we drove home the short distance from Panera tonight, Theo said, out of the blue “Mommy, I miss the baby that died inside your tummy.” I cringed and tears rolled down my face as I replied “I miss her too.” He immediately moved onto his next topic of conversation, which was telling me that we should have an x-ray machine in our house, while I gulped for breath.